Ecumenical friends from near and far turned out in force for the Licensing on 17 September of Revd Canon Dr Leslie Nathaniel as new Chaplain of the Anglican Church of St Thomas Becket. Also there to welcome him was the British Honorary Consul, Nicholas Teller. Father Leslie, until recently the Archbishop of Canterbury’s International Ecumenical Secretary and European Secretary of the Council for Christian Unity, has been eagerly awaited in Hamburg, not just by the Hamburg congregation but also by the wider Christian family in the north German city where there is a thriving ecumenical partnership between the churches. Leslie, who was born and brought up in South India and has worked in both London and Germany, was supported in Hamburg by his wife Revd Julie Lipp-Nathaniel, a non-stipendiary assistant in the Stuttgart chaplaincy. This Indo-Swabian partnership, said Leslie, still has a lot to learn about the north German way of life. After the Licensing, they now have plenty of new ecumenical friends eager to show them the ropes. The Primus of Scotland, the Archbishop of Wales and the former Archbishop of Canterbury Rowan Williams have called on the British government “urgently to revise its policy towards refugees”. They are amongst a large number of Anglican bishops and clergy from the UK who have put their name to an open letter to British Prime Minister Theresa May. It has been signed by 224 faith leaders including our Suffragan Bishop, Rt Revd David Hamid. 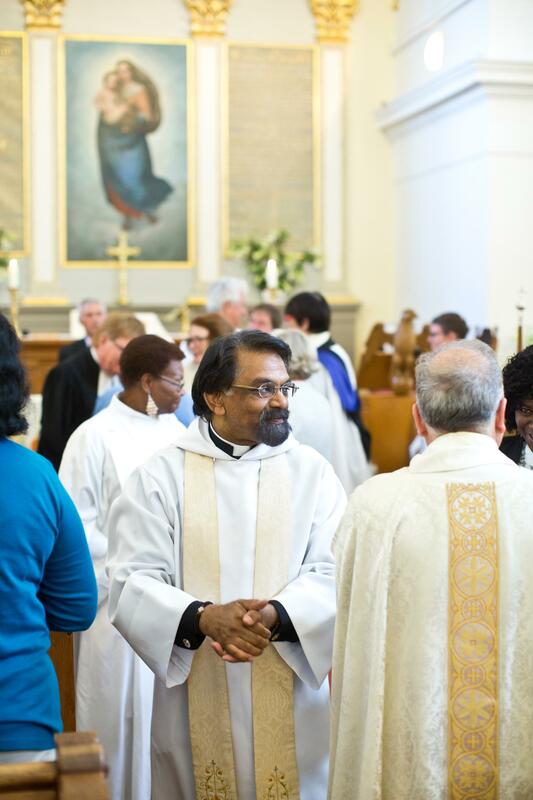 Read the full story on the Anglican Communion News Service website. It is 25 years since the Meissen Agreement between the Church of England and the Evangelische Kirche in Deutschland was signed, with one of its goals the full visible unity between our churches. In a message to the Meissen Commission to mark the 25th anniversary, the Archbishop of Canterbury Justin Welby writes: “As we celebrate 25 years of Meissen and plan the 500th anniversary of the Reformation I pray that we continue in our efforts to build a confident church in a pluralistic and troubled Europe across all barriers.” The full text of the message, in which he also thanks our chaplain designate, the Revd Canon Dr Leslie Nathaniel, and the other co-secretary of the commission, OKR Revd Christoph Ernst, for their tireless work, can be found here. You can read more about the Meissen Commission on the websites of the Church of England and (in German) the EKD.